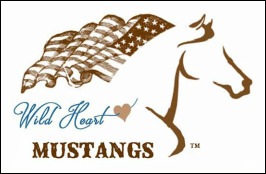 The Wild Heart Mustangs™ logo features a strong symbol of something we feel passionate about - the American flag. The freedom that Americans enjoy has never been free. It's been defended and preserved by countless military men and women who've given their time, energy, strength, heart - and sometimes their lives - in the name of freedom. This page is dedicated to those in the military now, and in the past, and to the families who watched, waited and prayed for the safety of their loved ones. 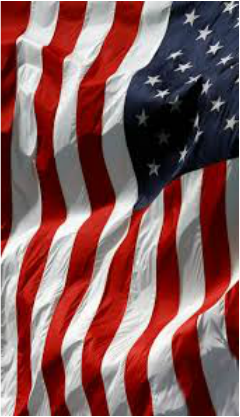 Let us never forget those who have served this great country. Thank you ALL for your service! On this page, you'll find articles about honor, health and healing for the heroes among us, with a section of resources that we hope will help and inspire you. If you have questions that aren't answered here, please let us know and we'll do our best to assist you. Lois Dawn Fritz is a Navy veteran who has battled PTSD, anxiety, depression and substance abuse. Through Lois' struggles with every day life, she found healing in her animals and especially her horses. Lois is now the proud owner of New Freedom Farm, and has rescued two pregnant mares bound for slaughter. 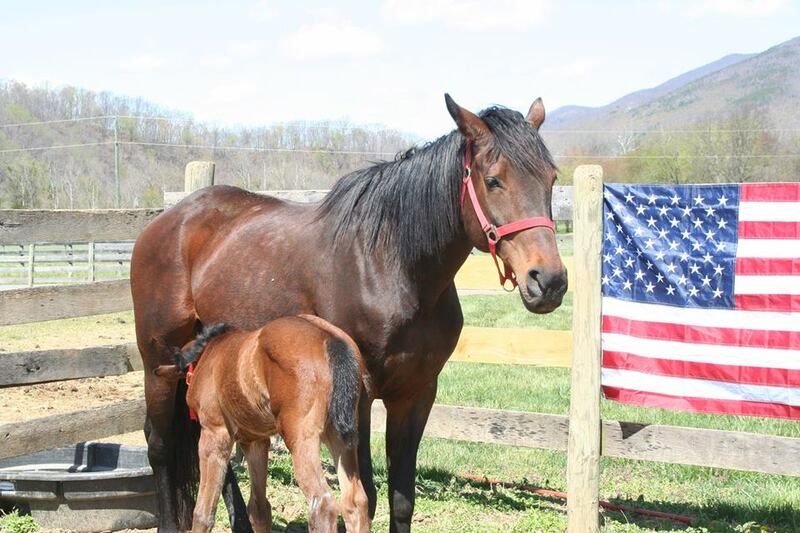 Lois' dream is to open New Freedom Farm to other veterans to help them heal and find the same "new freedom" that is bestowed upon her rescued mares and foals. A chance for a new beginning fostered from hope, love, kindness and believing in someone when they do not have the strength to believe in themselves. Lois Dawn Fritz presently resides with her loving supportive cheerleader/ husband in rural Buchanan, VA. She is advancing her dream of establishing an equine therapy program. She can be reached at loisdawnfritz@gmail.com or by way of the farm’s Facebook page “New Freedom Farm”. When asked to share my “story” with others…initially, I did not want to draw any attention to myself. Inside my head I knew God, my husband, my friends, my horses and dogs deserved the credit for the state of wellbeing that I enjoy today. I'm now fast approaching 47 years old… as a little girl of an alcoholic dairy farmer helper and homemaker mother, I always admired the horses around the farms that surrounded the many houses we called home. I was frequently told I was too poor, too dumb or too stupid (I am learning disabled) by the "horse girls" to ever own a horse. I put my dreams aside and went on about my life. I was raised in a dysfunctional, abusive and in every way imaginable, upside down family. I survived childhood and when I turned eighteen joined the US Navy. I served our country proudly, sometimes through difficult and dangerous situations and came home from the Navy where I managed to raise my son as a highly functional, over-achieving single mother – sometimes holding down 2 or 3 jobs at a time. During this time some PTSD, depression and anxiety began to set in, but I knew I had to keep it together to be the best mother I could, the mother to my son that I did not have growing up. On September 24, 2009 my 38 year old brother, who was my absolute best friend, died suddenly. In the following September of 2010 my son had an employment opportunity in Mississippi that he accepted and moved away. The loss of my brother and the departure of my son became the catalyst for my downward spiral that I had fought for years, and my PTSD, depression and anxiety took over. I began to self medicate with alcohol and went from doctor to doctor for medication and therapist to therapist looking to find the right fix. At one of these appointments it was suggested that I do something I had always wanted to do even as a young girl, ride horses. At the age of 40, I went for an hour long horseback riding lesson. The poor horse was old and "not right", something even with my equestrian inexperience I knew. I asked if I could just get my own horse and this is where my healing began. At the time my then fiancé, and now husband, bought me my very first horse named Chip, aka My Golden Boy. Despite my excitement, I had too much fear and insecurity to list; after all, I had only admired horses from afar up till then, and only had one hour lesson under my belt. The wonderful lady who sold me Chip believed in me, thank God. Though I'm not sure how she could not. I showed her that I could afford to keep Chip and had a checklist of a million first-aid supplies purchased and waiting for him at the barn. I worked with Chip literally on the ground for about 18 months, just him and me. I spent hours and hours grooming and loving him. He started my healing in life. During this time I had other life changing events which affected me psychologically, physically and emotionally. There was not a day that went by that I didn't feel that being near or with Chip was for me, a safe and secure place to be. My hours of talking with Chip had started my healing process. Lois with Chip aka "My Golden Boy"
In September 2012 I had major liver surgery and spent weeks in and out of the critical care unit with drains hanging out of my stomach and tubes out of my neck. I looked at my husband and said, "Please let me live, and by the way, can I get another horse?" He said, "When you get better you can get another horse." As my health improved my husband fulfilled his promise. I went to an auction in upstate New York with biliary drains tangling out of my abdomen and bought a lovely Percheron whose sheer size provided me comfort and love. I believe that I could feel this horse's pain and he could feel my pain. Unfortunately, he came down with a devastating case of colic and passed away on the surgery table; 1 year and 9 months after we brought him home. This only added to my anxiety and depression. Determined that Chip could not be alone and needed a buddy, I rescued an Appendix QH named Levi. Shortly thereafter, came Dutch, a BLM Mustang from Bitner, California and his tag along Eli, a Tennessee Walker. While Dutch arrived with a strong sense of independence and honesty common to many wild Mustangs; Eli came off the trailer full of fear. His fear was something I could relate to. He was extremely head shy and hyper-sensitive. He was underweight with an amputated tail and numerous other signs of trauma. His ground manners were so explosive that my veterinarian said, "Lois, get rid of him or you're going to lose your life or a limb." This was a life lesson, allowing me to stand up for myself and my horse. I chose not to give up on this horse, who at four years old, had arrived at his ninth and final home. I would stand up for Eli in the same way the special people in my life stood up for me and didn't give up on me, even in my darkest days. The Star D models (Amy, Lori, Stacy, Kelley, Kim, Lois and Mitchell) with Dutch, Chip, Levi, and Eli posing for ACTHA (American Competitive Trail Horse Association) photo shoot! Because of my learning disability and the fact that I am left handed, simple tasks can be very difficult for me. When I asked trainers for help with Eli, I struggled. The trainers tasks were easy for them, but not for me. Knowing my learning deficit and how I best learned a new task; my ever present husband would break down the steps and the goals for me to a single task to teach Eli. In retrospect, this approach to teaching Eli and I was tremendously advantageous for both of us. Eli taught me patience and to love unconditionally. The love I gave to him was, and still is, in the same form of gentleness that I needed all along. I had to learn to say to myself the same things that I would say to Eli. My gentle touch with Eli is also the same thing that I am now learning to do for myself. This was something I had missed during my formative years, like many individuals in dysfunctional relationships, but thanks to Eli I know it now. If I go too fast with Eli's training, he reminds me to slow it down. Every time I work with him I remember to focus on being in the present and peaceful. One day at a time, sometimes one minute at a time, we break the lessons down to their tiniest pieces. After a year of working with Eli, my veterinarian told me he was glad that I kept him and that my life was safe. As a testament to how far Eli has come, we won some ACTHA AOC (American Competitive Trail Horse Association - Obstacle Challenge) events in-hand in the summer of 2015. At one point in my life my PTSD, depression and anxiety was so bad it took all my strength to get out of bed. There was even a time when I was not able to go to the grocery store. My daily activities consisted of work, barn and home. I felt as if the horses and my dogs were the only species that could understand me. I spent a lot of time alone with my horses releasing tears, fears and pain. My horses provided me with the strength to go on. I was truly suicidal and wanted the flashbacks and pain to go away. Alcohol numbed those feelings and my horses made it so I had to get out of bed to care for them. The emotional support a horse can provide is one of no other kind. The size and strength of my horses seem to uncover and make it safe to explore the pain. There truly are no words to describe the therapeutic effect my horses have had on me. On my horse journey, I have met wonderful, loving, kind and supportive people including the owners and boarders at the Star D Farm, Harmony, New Jersey where my "knights in shining amour" were boarded. Each and every one of them has been supportive, helpful, and fun to be around and have played an enormous role in my recovery. I feel strongly that my horse journey has now only just begun after my first empowering ACTHA weekend. I came home and signed up for 3 more weekends of fun, fellowship and love. The emotional support from my horses has helped me regain trust in myself and other humans. Riding out on the trail on day one of this event, a spiritual transformation occurred for me. I relied fully on my faith and my horse. When I completed the trail ride and was back at the barn, I made a startling realization, all the insecurities, fears and panic were gone. I sat on the bank of the arena thanking God, ACTHA, my horses and the people who put all their time and hard work into this event. Truly, for the first time in over 7 years I was free of medication and I was away from home, without my husband. The ACTHA event was life changing for me. On day 2 of the event, Chip and I rode around the arena with the United States flag…PROUDLY, honoring all those who have served and praying for those still serving. Lois and Chip at ACHTA Event 2015 proudly carrying the American flag in honor of all veterans... past and present. "My horses have healed my emotional scars and ACTHA has given me the opportunity and courage to leave the farm and continue on my equestrian journey with my 'knights'." In July 2015, I experienced another life changing event. My cousin and her daughter (ages 46 and 19), drowned while kayaking on the local Delaware River. It was that week when I decided life was too short not to follow my dream of having a safe haven for humans and horses. In September 2015, I found the farm of my dreams in southwest Virginia. We signed a contract and waited for what seemed to be an eternity to close on this piece of heaven. A leap of faith was required. I went to closing with $17.00 left in my checking account. In November of that year I went on a deferred retirement from the local prosecutor’s office where I served as a forensic nurse investigator and began a new career as a hospital based forensic nurse examiner at Carilion Roanoke Memorial Hospital near our new farm in Buchanan, VA. In August 2015, as a favor for a friend I went to Lorton, VA to pick up a Mustang for her from an internet adoption. I was faced with a coral full of 60 yearlings and a little filly found me, I tell the story she just happened to jump on the stock trailer I was driving. I brought her home having zero experience with green horses, let alone one who had never been touched by another human being. When I was able to touch her for the first time it was like I had given birth to her. Cecelia has been with me for 9 months now, and I love her to pieces. I’ve promised her that she had arrived at her forever home. During the time since her arrival in my life, I have had the privilege to gentle her and begin giving her the structure and support she needs to blend into our herd and our human life with safety and good behavior in hand. I look forward to the day that she is old enough to begin training under saddle and continue to have high hopes that Cecelia will be counted among my horse success stories as her time with me unfolds. As much as I must teach Cecelia and develop her attributes as she grows into adulthood; she teaches me honesty and integrity in a way that only a once wild Mustang can. 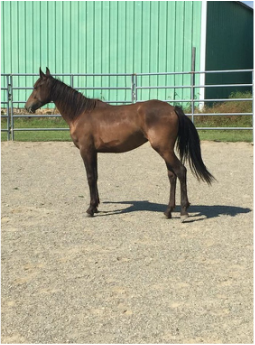 L'Oreal - a pregnant mare rescued from slaughter by Gerda's Animal Aid, fostered by Lois Dawn Fritz and then adopted by her. Now living a new life filled with love and encouragement at New Freedom Farm. By March 2016, my first pregnant slaughter bound mare, Mabeline, arrived at the farm. She was the inspiration for how New Freedom Farm was named. She had received the gift of a new freedom and through our horses we hope that humans who are hurting will also have a new freedom by visiting New Freedom Farm. The rescue mare gave birth to a lovely filly that we named Liberty. As I write this article I have already rescued and adopted a second pregnant mare, L’Oreal. She’s here at the farm now and is due to foal any time. L'Oreal, New Freedom Farm's second cover girl, getting an ultrasound. 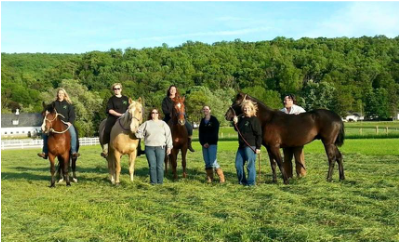 In the Fall of 2016, I hope to have our non-profit status completed and our equine therapy program in full operation so New Freedom Farm can fulfill the mission of helping service veterans and other survivors with PTSD, anxiety, depression and substance abuse issues. 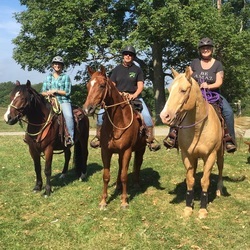 ​Lois Dawn Fritz presently resides with her loving supportive cheerleader/ husband in rural Buchanan, VA. She is advancing her dream of establishing an equine therapy program. She can be reached at loisdawnfritz@gmail.com or by way of the farm’s Facebook page “New Freedom Farm”. If you have a special someone you'd like recognized here, ​or a story to tell, please ​let us know! And if haven't got a particular soldier to remember, but would like to post your own message of gratitude and honor here, we'd love to hear from you, too.